Idea Cellular subscribers now get the choice to choose the benefit they want from a recharge. Idea has today announced the launch of ‘Choice Recharge’ Offer for its subscribers in Tamil Nadu. A single recharge of Rs. 15 now offers 5 choices which include: Idea to Idea Calling, SMS, Local Mobile Minutes and Internet Offers. 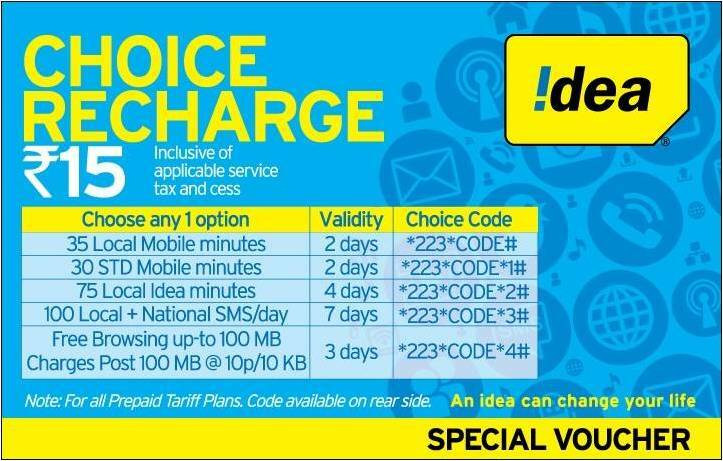 Idea customers can purchase the recharge coupon of Rs. 15 and get to choose any one of the listed five benefits by dialing the appropriate code as given in the voucher. The customer can select the desired benefit and avail the offer by following simple instructions. The recharge coupons are available at all major mobile retail stores and Idea outlets across the state. I think what Saurabh said is correct. In unlimited 3G minutes pack, the pulse rate is 1 minute and not 1 second. So the balance will ne deducted by 1 minute even if you have used for 30 seconds. Note that it is data and not voice. If you have enabled per second voice pack, that doesn’t mean that it should apply for data also. From this note that all unlimited 3G minutes pack will be charged every 1 minute basis and not per second basis. Not even a single data pack (2G or 3G) will work while national roaming and you will be charged Rs.0.10 per 10 KB. I think this will apply to Idea customers in all the circles. Even airtel 3G pack will not work in national roaming. I don’t know about other operators.